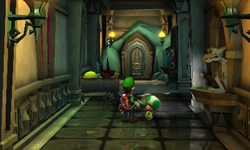 The Grand West is a location in Treacherous Mansion in Luigi's Mansion: Dark Moon. It is a corridor that connects together the Dark Age Exhibit, Inner Courtyard, Kitchen and Ice Age Exhibit and is located along the left side of the mansion on the ground floor. In this area, there are various gargoyles that can be interacted with for coins, a food cart located right next to the west wall and a couple of drawers with differing contents. There is also some snow in front of the Ice Age Exhibit door and a small hole near the Kitchen entrance that can be used to see inside, and a trapdoor right next to the door to the Kitchen which will hurt Luigi. In Double Trouble, the Grand West is used by Luigi to get from the Dark Age Exhibit to the Ice Age Exhibit and to reach the kitchen. In here, a food cart will come flying down the corridor from the Kitchen and miss the player, and an invisible dresser near the Dark Age Exhibit door can be revealed to find a Gold Greenie. This room has no real use in later missions other than as a possible way to reach the two aforementioned exhibits or the Kitchen. This page was last edited on February 27, 2019, at 21:30.